The letters of the Latin alphabet haven’t changed in eons, and there is limited latitude in how much a designer can modify or embellish the basic shapes. The ampersand, however, is a shinning example of an exception to the rule. It has a well-deserved reputation as being one of the most distinctive and fanciful characters in the alphabet. 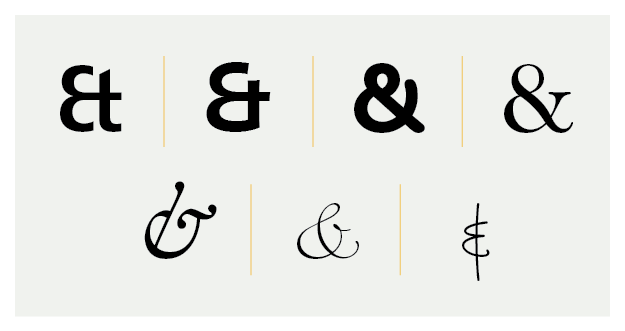 Rooted in the Latin “et” (meaning “and”), the ampersand is a ligature composed from the letters “e” and “t”. The word “ampersand” itself is an alteration of “et per se and,” which became corrupted to “and per se and”, and finally “ampersand.” The history of the ampersand dates back to 63 B.C.E., and was a commonly used character during the Incunabula. For example, a single page from a book printed by Aldus Manutius in 1499, has over twenty-five ampersands! While playing fast and loose with ampersands isn’t a good idea, and client guidelines should always be respected, there are times when a little ampersand creativity can produce excellent typographic results. The following are a few guidelines and suggestions for getting a little more from this special character. The ampersand in the italic designs of the Bulmer®, New Caledonia®, and ITC Legacy® Serif typeface families is in keeping with lowercase proportions, but the majority of ampersands are of the capital variety – and these can pose a problem when used in text copy. Like ranging numbers, big ampersands in a line of lowercase letters can stand out too much, disrupting the flow of the eye across a page. Full size ampersands can standout in text copy. The solution is to use the small cap version of the ampersand in text, or try using the next heavier weight, if it is not too dramatic a change, and downsize it to approximately the lowercase x-height. Both give you an ampersand at a more moderate size. Some typefaces have more than one ampersand as part of their standard character set. If this is the case, limit yourself to using just one version. Ampersands may be subtle in text copy, but they are not invisible. If you use more than one style in a single piece, readers may notice the change and distraction would be the inevitable result. Ampersands can also be used to overcome uneven word spacing in lines set justified, to clean up the rag in unjustified text, or to get rid of a widow without rewriting. Finally, lines of text copy can look fine beginning with an ampersand, but not ending in one. And ampersands should not precede a comma. Ampersands are a natural for display typography. They can make headlines both shorter in length and more appealing to the eye. Headlines of just a few words are not only read faster, they also have higher levels of comprehension than the longer variety. Headlines with a selectively placed ampersand can also be more effective than just words. They can attract and hold the reader’s attention better than the “words only” variety of headlines. Another good thing about ampersands is that they’re gregarious. 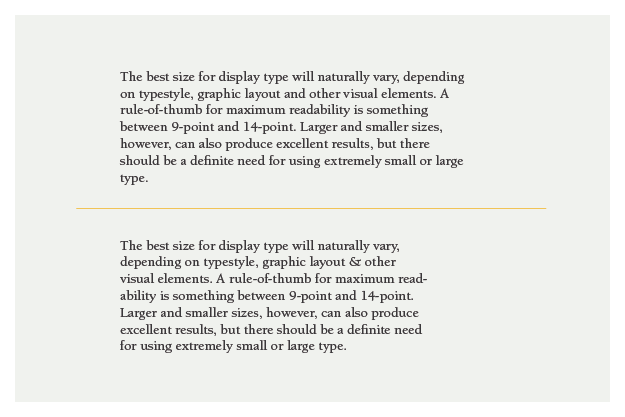 They are, for the most part, perfectly happy being mixed with a variety of type styles and typeface families. Take the ampersand from the Sabon® Italic typeface and use it to spice up copy set in the New Century Schoolbook® typeface, or mix a very ornate ampersand from a design like Vivaldi™ with words set in the Classic Grotesque™ typeface. Ampersands are also a natural for logo designs and signature lines. They become part of the design element. If you are using an ampersand very large, you may want to consider screening it back a little so that it is not overpowering. Use ampersands large, use them small – but use them. Type designers work hard to give you these handy symbols, take advantage of their labor.